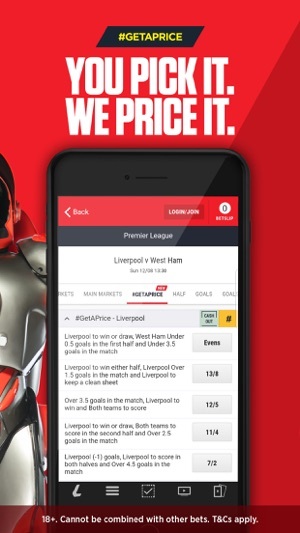 Whether you’re watching the game on the sofa or out and about, you’ll find an unbeatable range of markets on your iPhone or iPad with the Ladbrokes Sport Betting iOS app. But that’s not all. You’ll also be able to boost your own odds instantly, use Cash Out control, access tips, live streaming and much more. Keep the fun going after full-time. We’ve got hundreds of great Games and Slots just a tap away! Find them on the navigation bar at the bottom of our app. 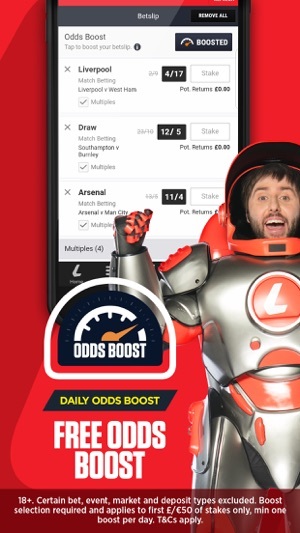 •	Odds Boost (http://www.ladbrokes.com/tc/oddsboost/) – Hit the Boost button in your betslip to increase your odds. You’ll instantly see the boosted price and returns. 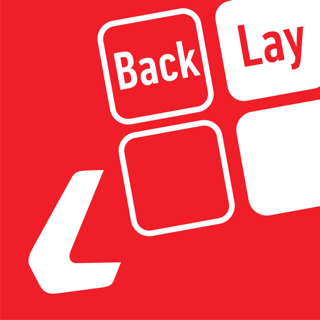 •	New In-Play betting page – We’ve updated the In-Play betting page to make it easier to bet on the action as it happens. 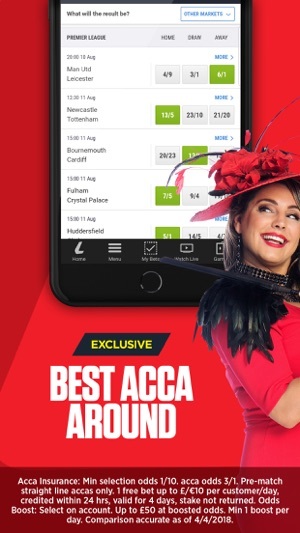 •	Best Acca Around (https://sports.ladbrokes.com/en-gb/promotions/best-acca-around/) Want to make the most of your acca? Then you’re in the right place. We have an unbeatable range of acca features to give you every chance of that big acca win! •	Live Streaming – Enjoy live streams of Horse Racing, Greyhounds, Tennis as well a wide variety of football. Live stats and graphics give all the info you need to make a smart bet. You can track your Live Bets and Cash Out without interrupting your Live Stream too. Ladbrokes are the title sponsors of the SPFL and Challenge Cup. 18+, Please gamble responsibly and only bet what you can afford. For gambling addiction help and support, please see below contact details for Gamble Aware in both UK and Ireland. We have been listening to your feedback and in this release, we have fixed a number of bugs to improve performance. Thank you for choosing Ladbrokes. I’ve been with Ladbrokes a little over 6 months and don’t ask for no bonus’ or freebies I play my money and don’t expect no favours, yet when u are given something but not actually given🤔 lol u are made to feel like a beggar if u dare question why or how come u weren’t given said bonus? I’ve been told I don’t qualify because of my loyalty level and even there was no such offer available it’s absolutely disgusting and I for one will never contact them regarding anything at all in future I know I don’t matter I’ve only deposited 3 grand in 6 months plenty of richer mugs than me but trust me poor customer service will eventually cost you Ladbrokes, I was told in couple hours my issue would be resolved but it’s gone 6 and this isn’t the first time it’s most definitely the last tho i shall be deleting my account with Ladbrokes and taking my pennies elsewhere if this isn’t sorted tonight lol and I know that won’t happen so looks like I better do bit of research and find a proper site! As for a recommendation lol it’s a no from me !!! Hey there! We're sorry you feel this way! If you contact our Twitter and Facebook teams, they will be able to help out further. Ladbrokes Sports Review Team. Been a regular user of the app for a number of years now and never really had any major issues- occasional app meltdowns but that’s to be expected. However, the recent updates over the past week have created more problems and more frequently. - often the app will come up with a blank white screen (no loading or buffering) and will freeze meaning the app has to be restarted. Hope this gets sorted soon as the only reason I continue to use the app is for my VIP status but will move to another bookies if not addressed. We are really sorry to hear about the issues that you have had with the app and the recent updates. 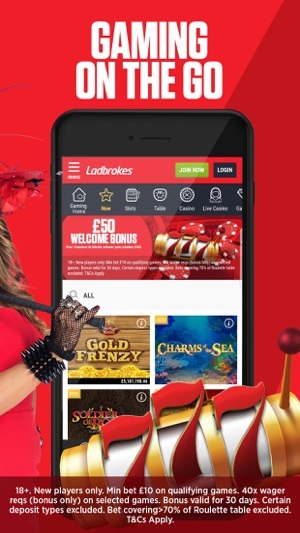 Can you please send me across an email to review@ladbrokes.com with your username and best contact details along with screenshots of what are you seeing when you are experiencing the issues so that we may be able to investigate further and hopefully rectify the issues where possible.